A chance to explore and deepen your experience with West African drumming on the Djembe and Dundun. No previous experience needed, come with beginners mind and be prepared to be taken out of your comfort zone. 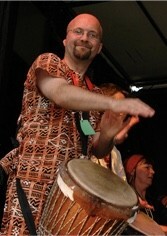 Lead by Mark Barfoot who has 15+ years experience teaching West African drumming and facilitated by Hugh Barney. In the last 2 years we learned rhythms called Yancadi Macru and Fura. This year we will do a new rhythm so that those that are returning will start in the same place as those who are coming for the first time. Starts: 6pm Friday 8th, Finish 3pm Sunday.